Sunday December 22nd 1878 Weather very cold indeed. Hatt did not get home today. We just staid in the house and did the work and rested. I read a little. Monday December 23rd 1878 Very cold indeed. Mother and I sewed carpet rags all day and all the evening. Just at noon Grand-ma and Uncle Jim came She stayed all night. Mrs Collins brought a doll cradle tonight for May. 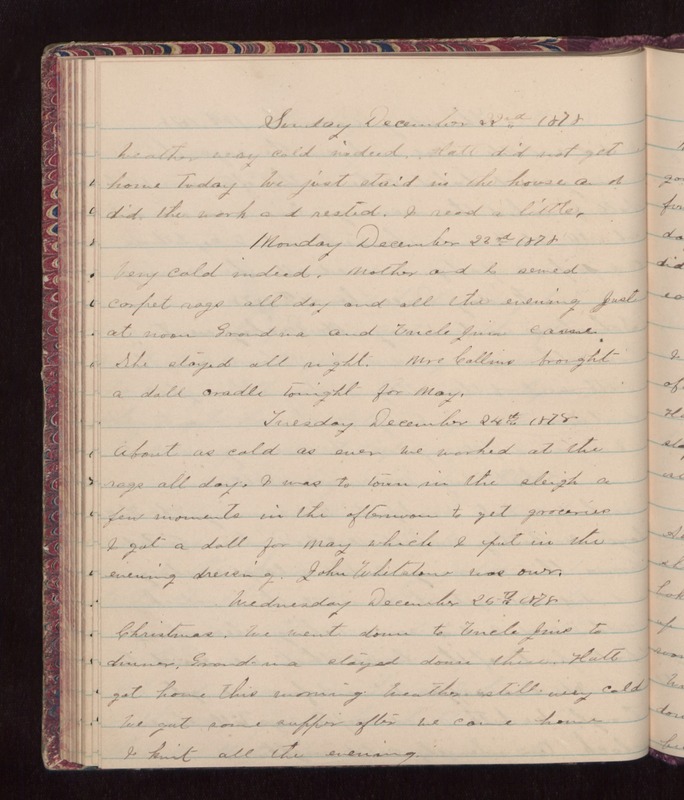 Tuesday December 24th 1878 About as cold as ever. We worked at the rags all day. I was to town in the sleigh a few moments in the afternoon to get groceries I got a doll for May which I put in the evening dressing. John Whetstone came over. Wednesday December 25th 1878 Christmas. We went down to Uncle Jims to dinner. Grand-ma stayed down there. Hatt got home this morning Weather still very cold We got some supper after we came home I knit all the evening.